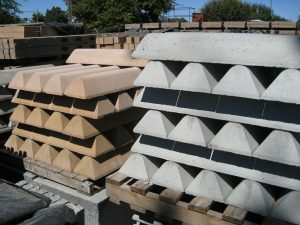 Dynamic precast can supply your concrete parking lot bumpers. They are available FOB our plant in Santa Rosa, CA.. We can also supply the colored plastic coated, concrete filled units if needed for handicap or other color coded uses. They come with holes for securing, and are an attractive unit with THREE rebars to resist pressures from any direction.